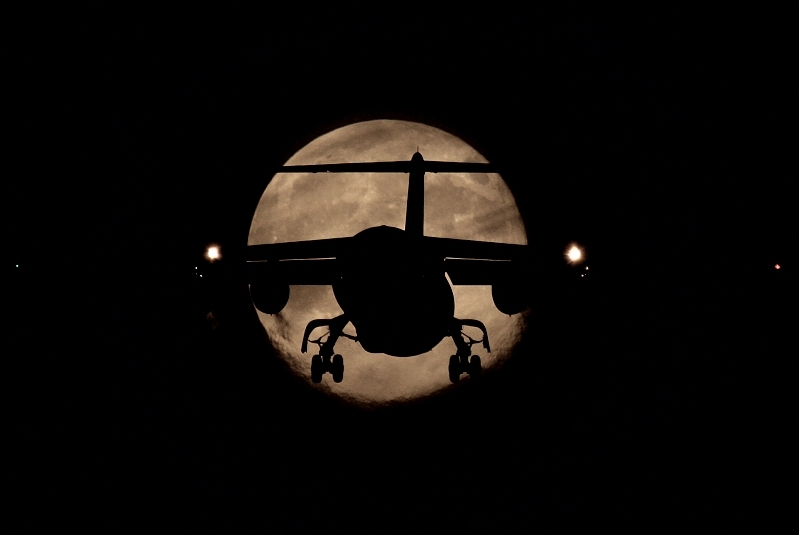 Below you will find some pictures of airliners taken when the Moon or Sun had an interesting angle. 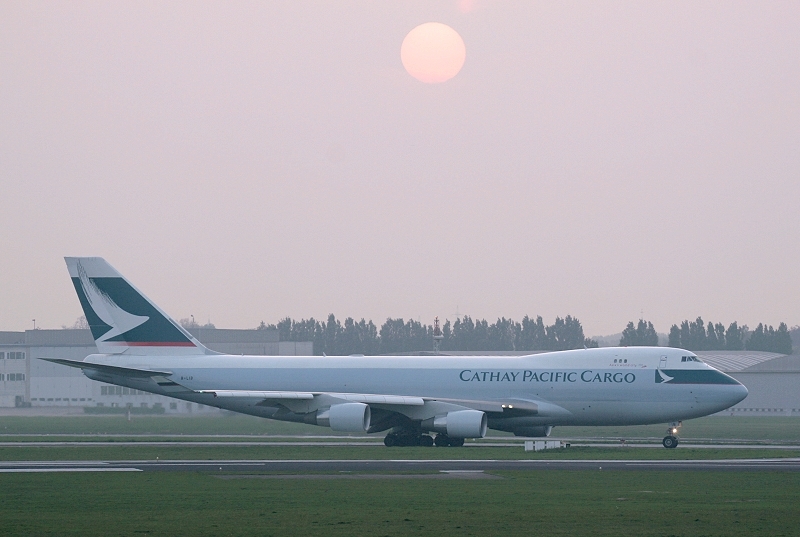 They were intercepted with my Canon 300D/30D/7D 50-500 mm zoom lens (eventually with 2x TC) and have been taken at various locations near Brussels Airport. Date read as: day/month/year - hours in local times (CET). 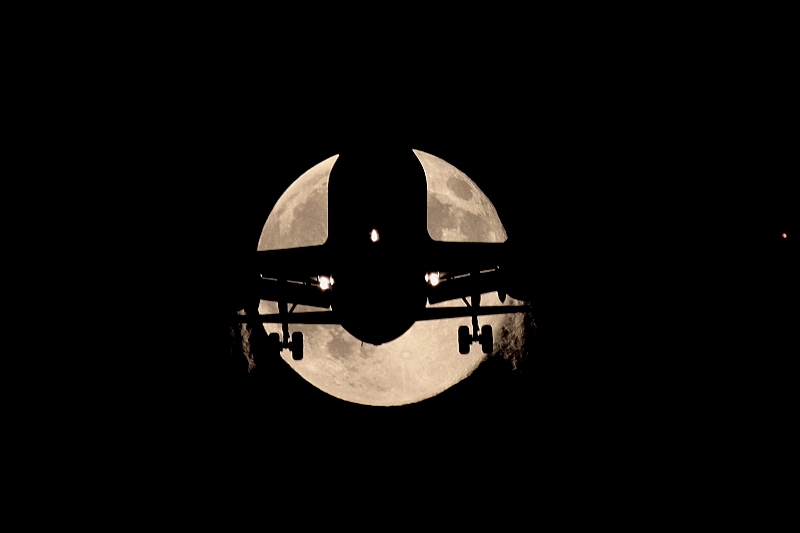 Pictures © SkyStef. High resolution digital format available for sale. For more details contact me. 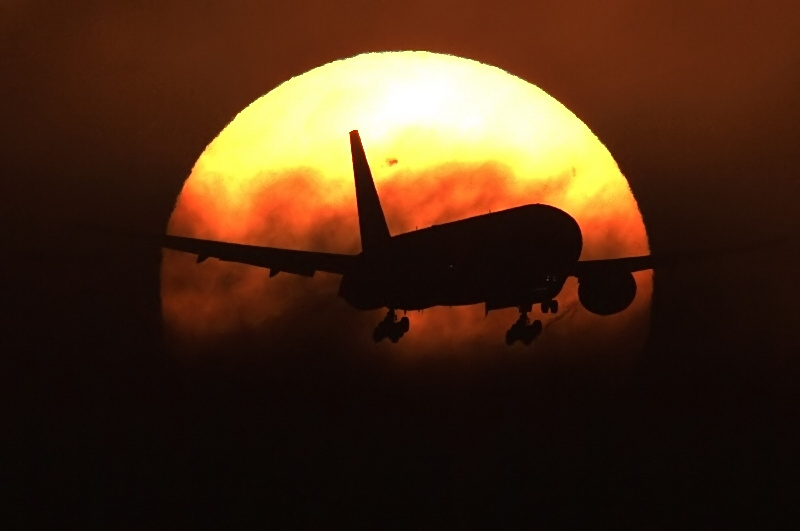 15/09/13 - 07:36. 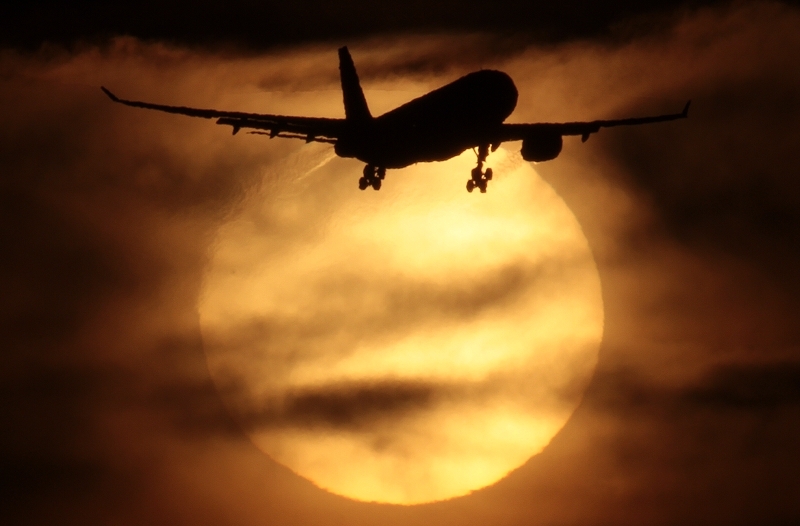 Jet Airways A330-302 VT-JWU was coming from Delhi as JAI230 on finals 25L catching a rising sun through clouds. 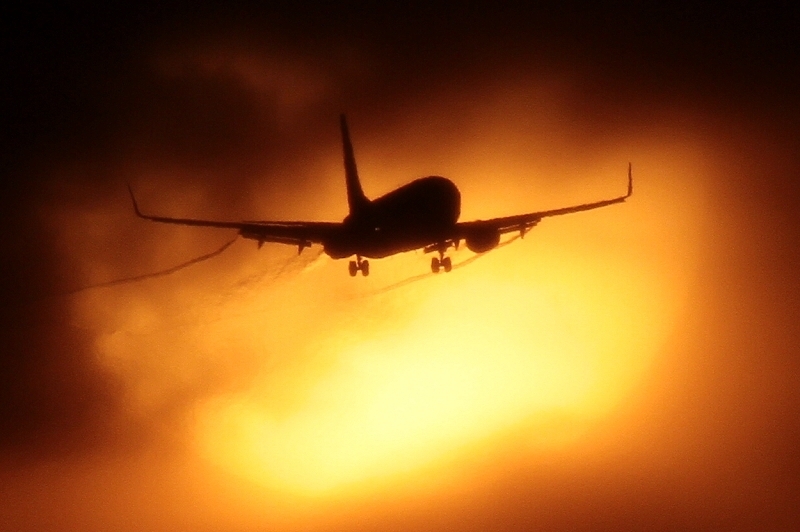 10/09/13 - 07:31. Pegasus Airlines B737-82R(WL) TC-AAT was coming from Antalya as PGT825 on finals 25L catching a rising sun through clouds. 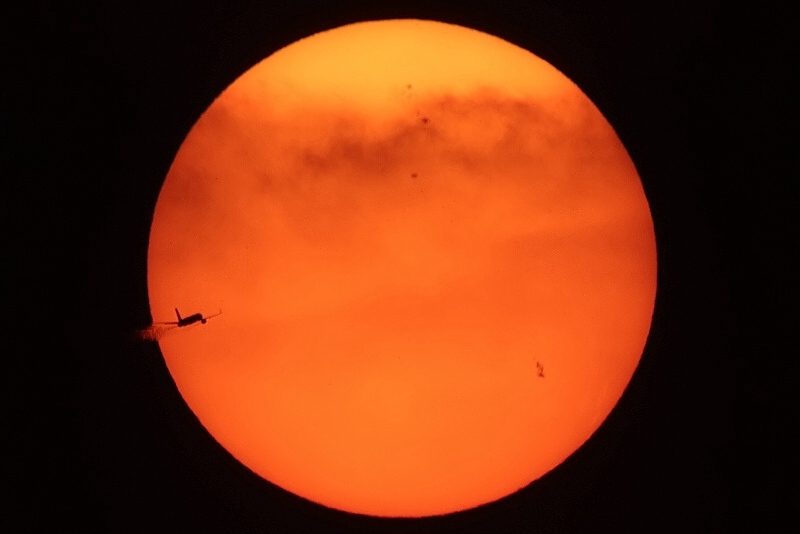 09/09/13 - 07:34. 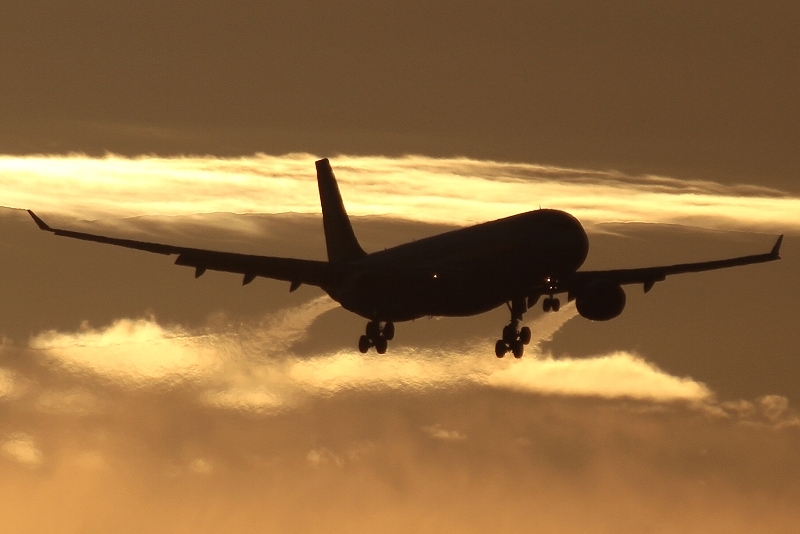 Jet Airways A330-302 VT-JWT was coming from Delhi as JAI230 on finals 25L in the morning glory. 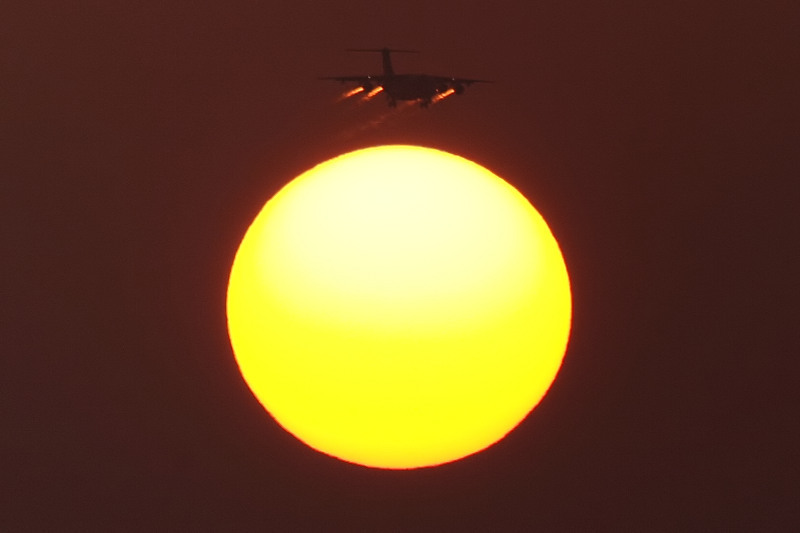 03/09/13 - 07:20. 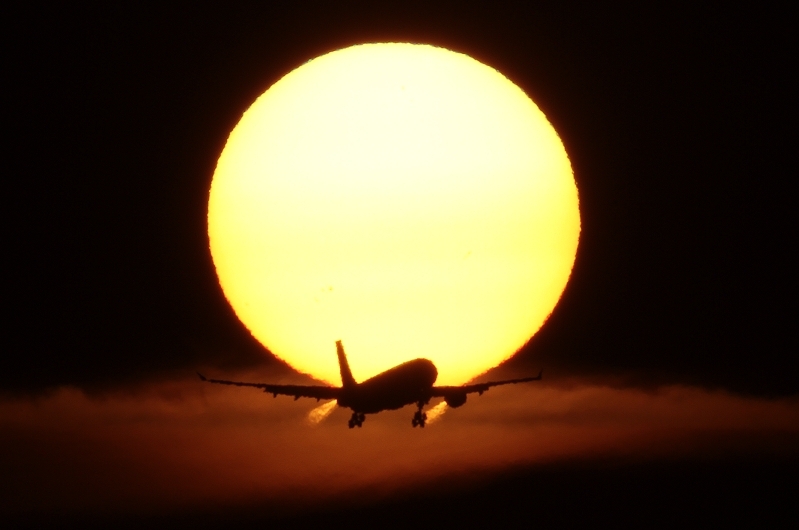 Jet Airways A330-202 VT-JWP was coming from Mumbai as 9W228 on finals 25L catching a rising sun. 16/04/13 - 07:08. 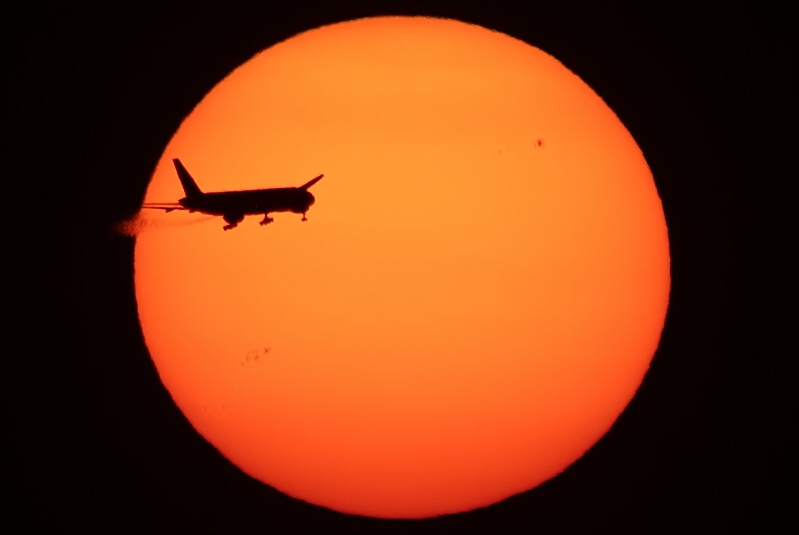 United Airlines B767-424(ER) N76054 coming from Washington as UAL140 at 3000 ft (distance approx 10 km) established on 25L with lowering gear catching a rising sun in thin Cirrus. 29/05/12 - 06:05. 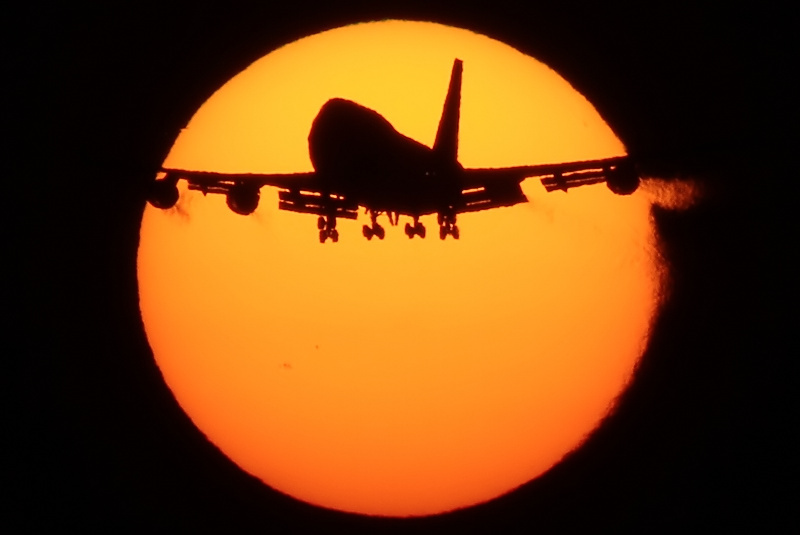 Korean Air B747-4B5(BCF) HL7485 coming from Chicago as KAL9560 at 1500 ft (distance approx 5 km) vectoring for 25R catching a rising sun with some sunspot below the airplane. 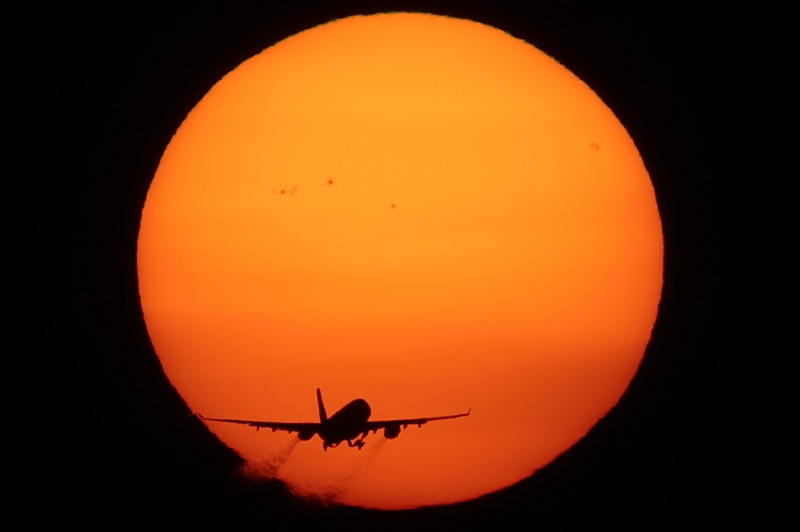 06/04/12 - 07:25. easyJet Switserland A319-111 HB-JZK coming from Geneva as EZS533L at 5000 ft (distance approx 30 km) vectoring for 25L catching a rising sun with a big sunspot above the airplane. 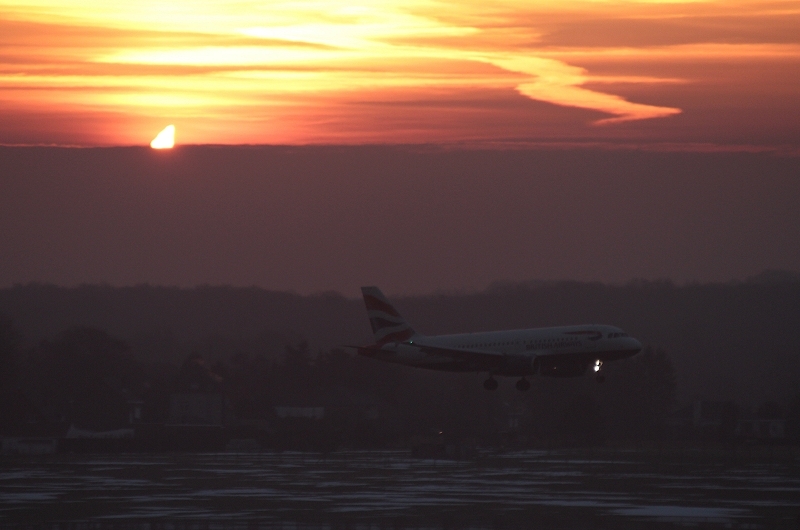 02/04/12 - 07:27. 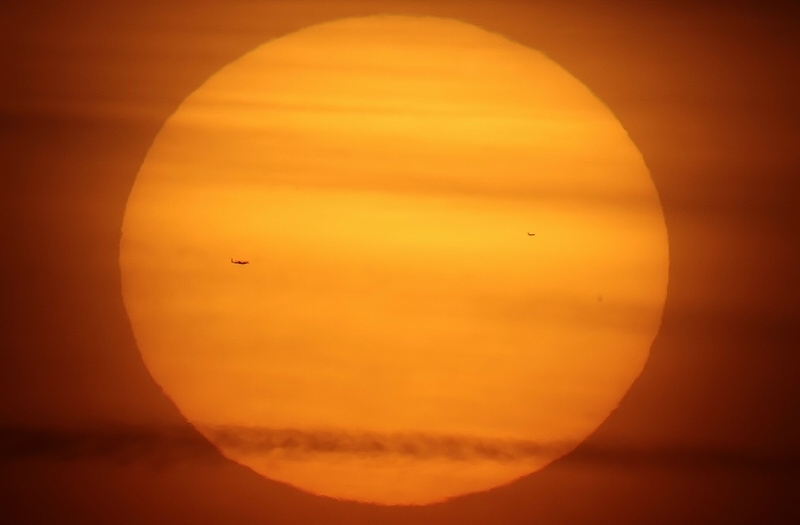 Through some thin Cirrus cloudiness, besides a weak sunspot on the most right side, two airplane can be detected: the biggest one on the left resembles the most to an Embraer 190 and at that moment PH-EZA of KLM Cityhopper was enroute Amsterdam-Bologna as KLM1651 at 28000 ft, so most presumable this was the one. 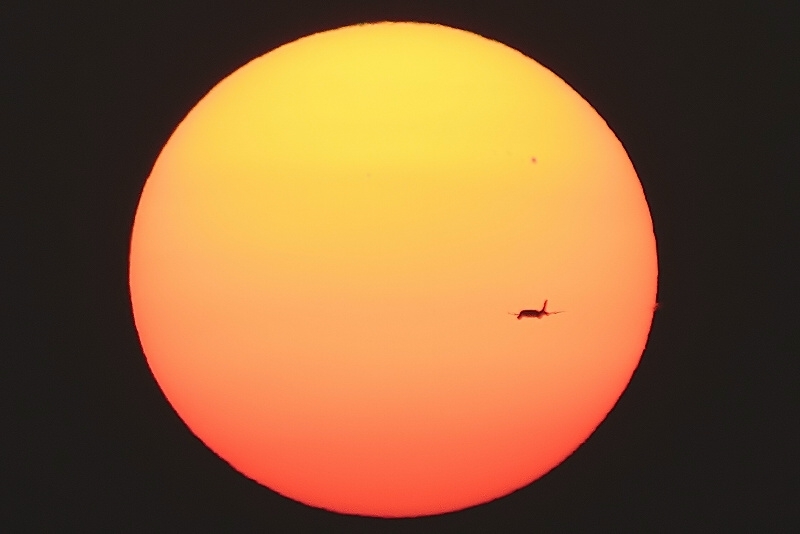 Distance of this non plotting machine on SBS is only a guess, roughly 100 km away. The smaller one on the right was most presumable B737-700 PH-XRW of Transavia enroute Amsterdam-Innsbruck at 39000 ft (without contrail !?) 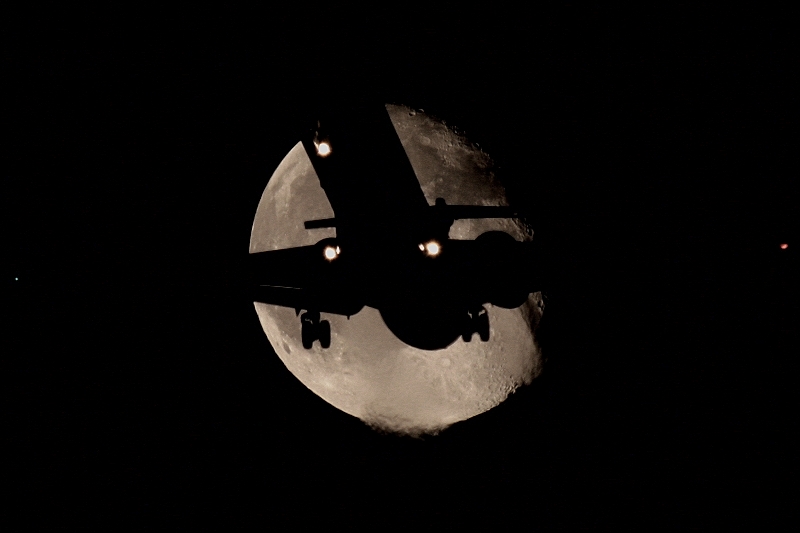 as TRA6833, which was at that time plotting over Dusseldorf (distance 165 km). 15/09/11 - 07:35. 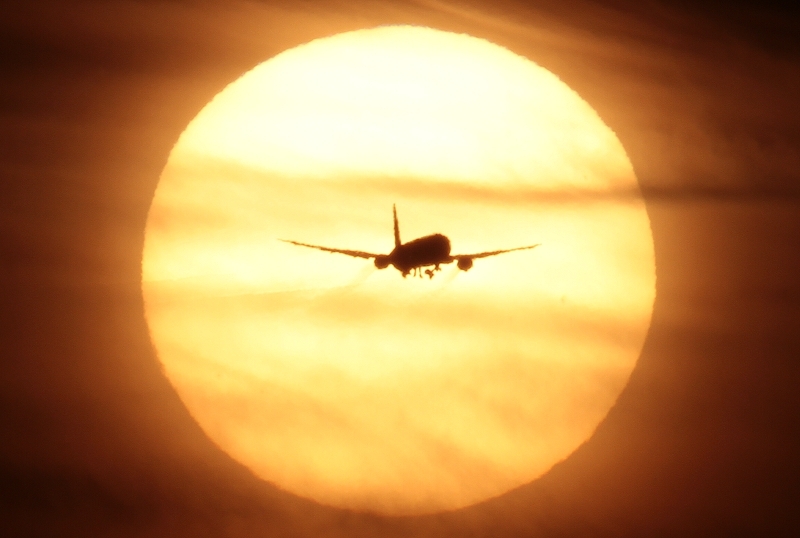 United Airlines B777-224 N78009 coming from Newark as COA60 on finals 25L catching a rising sun with some low clouds and one big sunspot. 15/09/11 - 07:33. 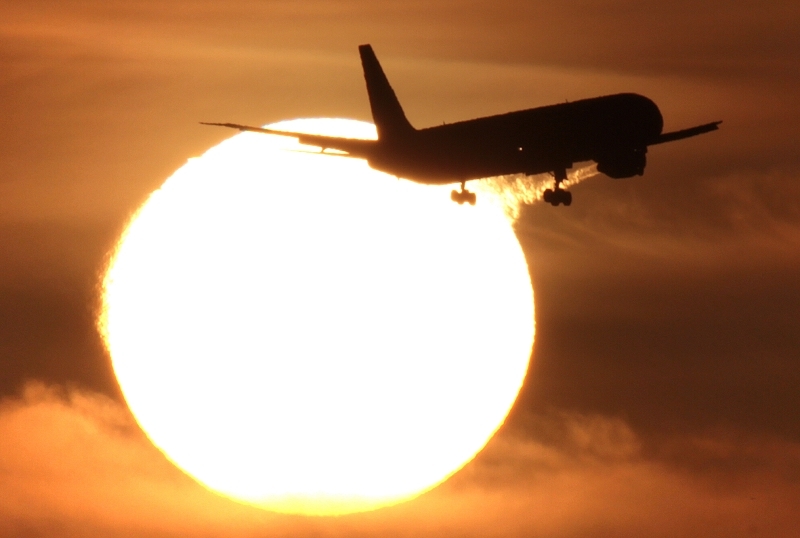 Jet Airways A330-202 VT-JWL coming from New York (JFK) as JAI226 on finals 25L catching a rising sun. 05/09/11 - 07:22. 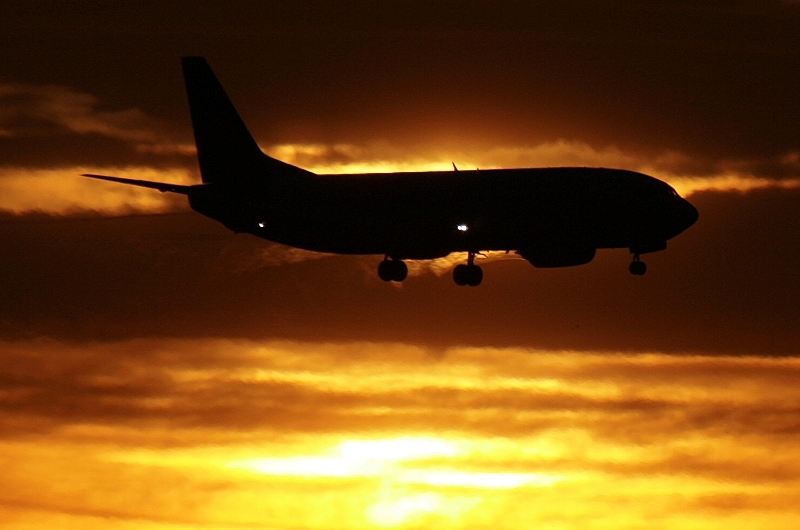 Brussels Airlines A330-322 OO-SFV coming from Luanda-Kinshasa as BEL359 on finals 25L catching a rising sun. 03/09/11 - 07:20. 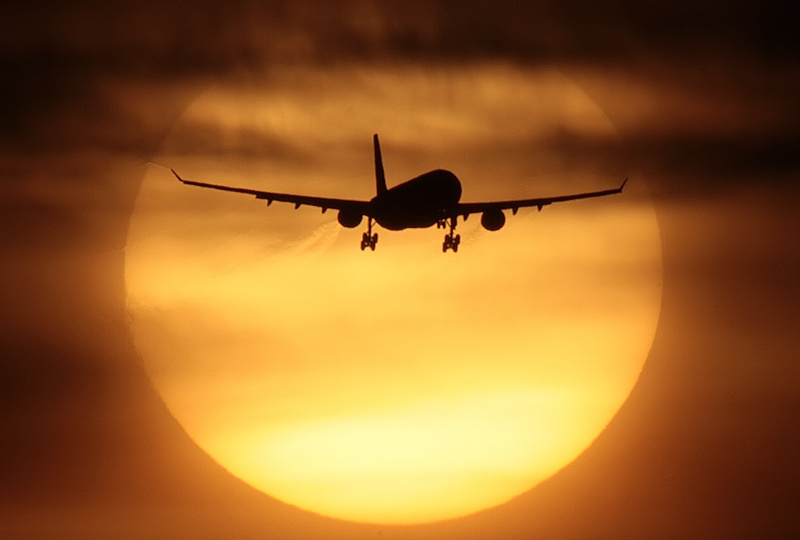 Jet Airways A330-202 VT-JWM coming from New York (JFK) as JAI226 on finals 25L catching a rising sun. 03/09/11 - 07:18. 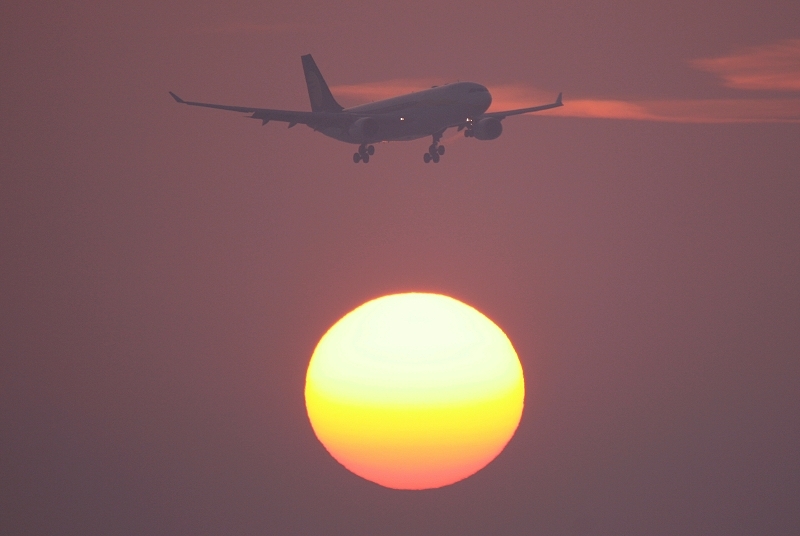 Jet Airways A330-203 VT-JWE coming from Toronto as JAI229 on finals 25L catching a rising sun. 22/04/11 - 06:52. 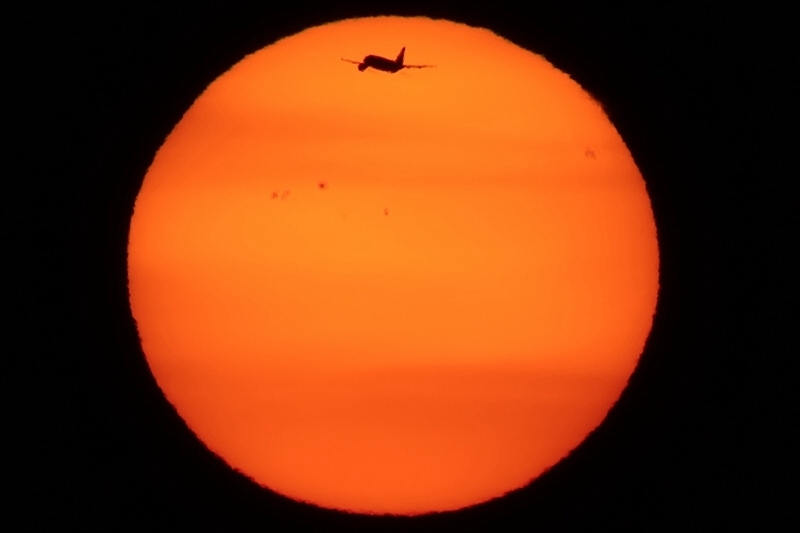 United Airlines B777-224 N779UA coming from Washington as UA950 at 3000 ft vectoring for 25L catching a rising sun with some big sunspots. 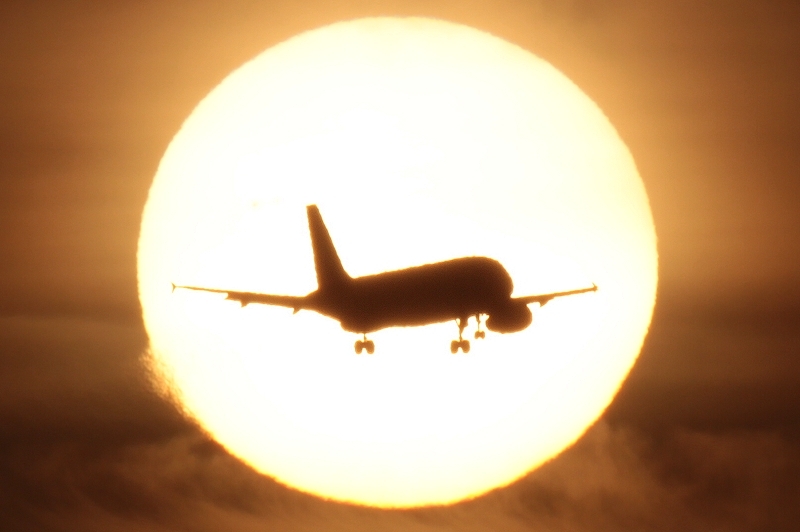 21/04/11 - 07:00. easyJet Airline A319-111 G-EZAI coming from Berlin (SXF) as EZY4701 at 3000 ft on finals 25L catching a rising sun. 18/04/11 - 07:03. 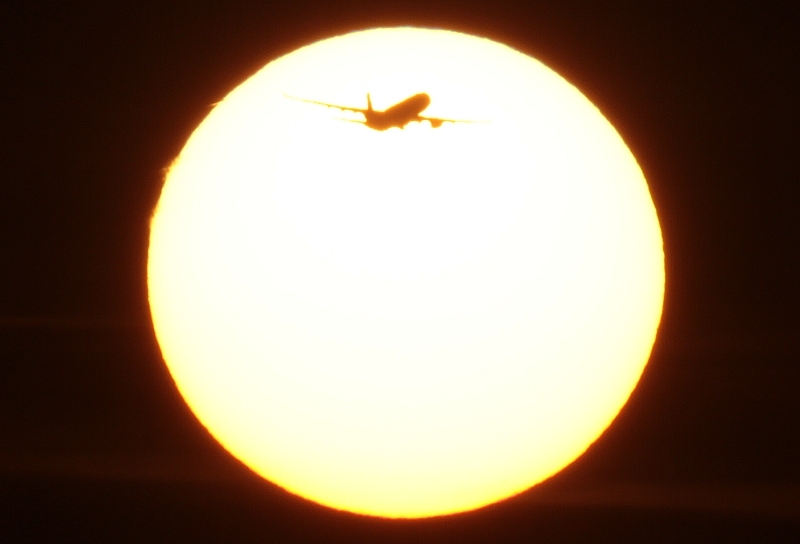 Jet Airways A330-203 VT-JWE coming from Toronto as 9W229 on finals 25L catching a rising sun with some big sunspots. 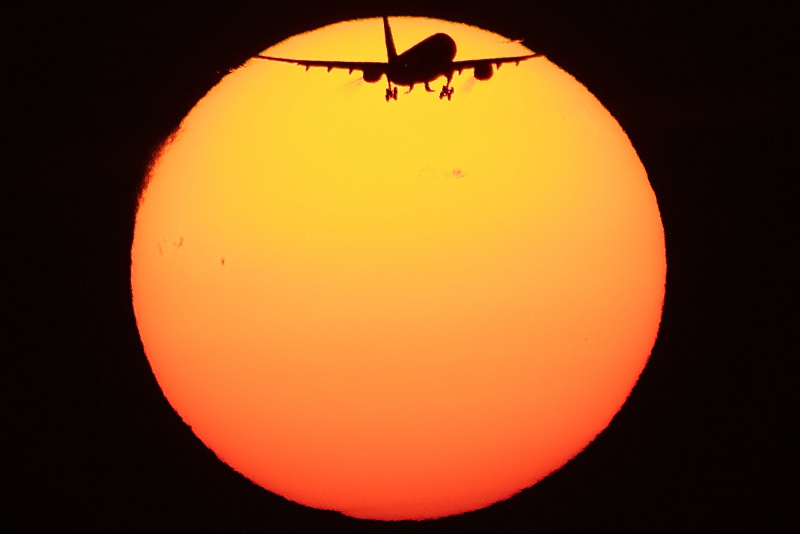 18/04/11 - 07:01. easyJet Airline A319-111 G-EZAP coming from Berlin (SXF) as EZY4701 at 3000 ft vectoring for 25L catching a rising sun with some big sunspots. 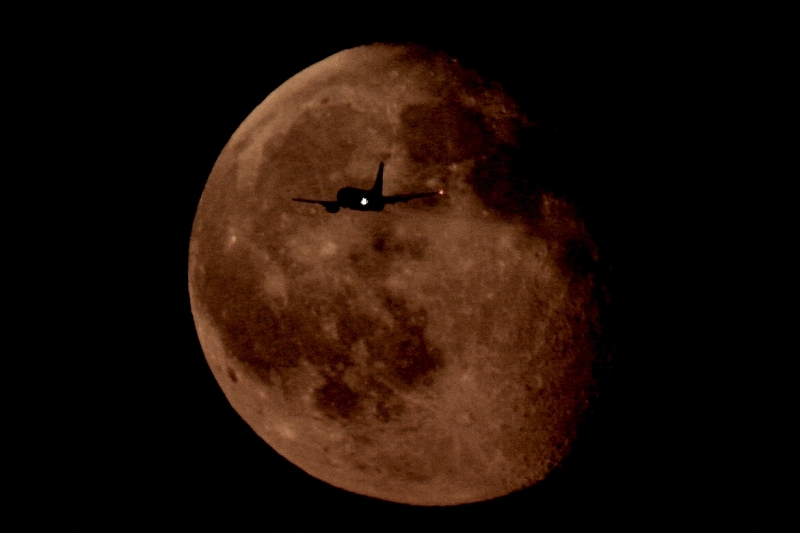 16/04/11 - 20:02. 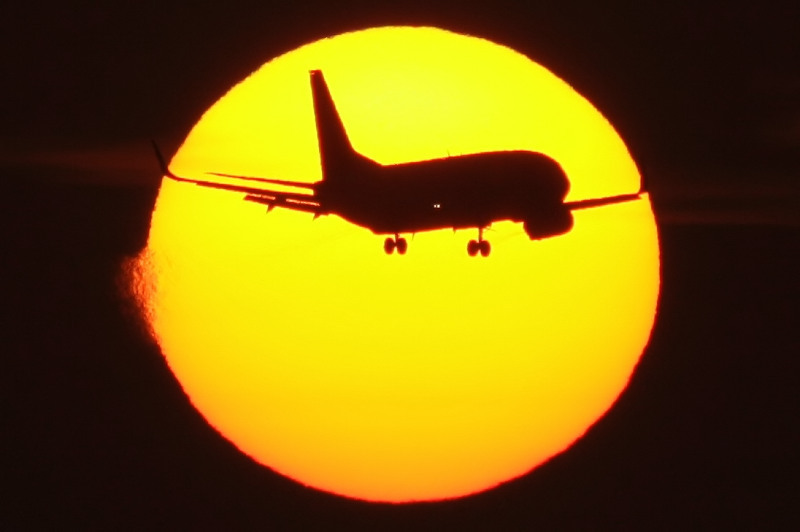 US Airways B757-23N(WL) N205UW after t/o 25R going to Philadelphia as US751 catching a setting sun with some big sunspots. 15/04/11 - 07:08. 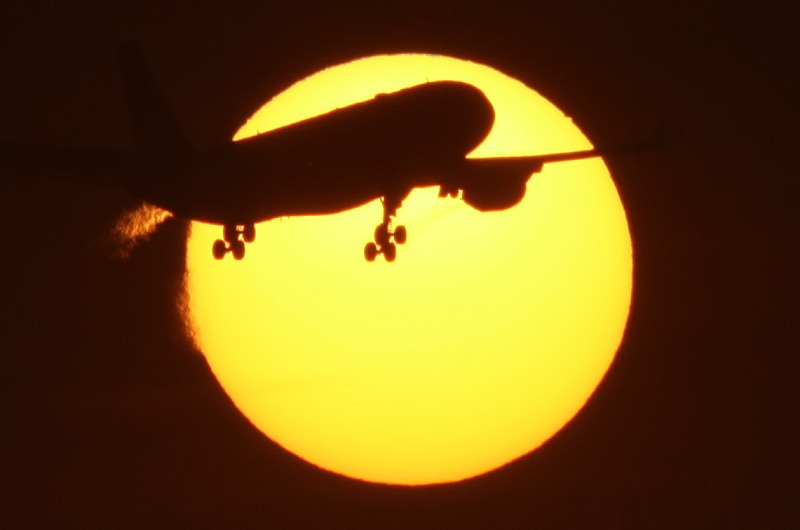 Jet Airways A330-202 VT-JWP coming from New York as 9W225 on finals 25L catching a rising sun with some big sunspots. 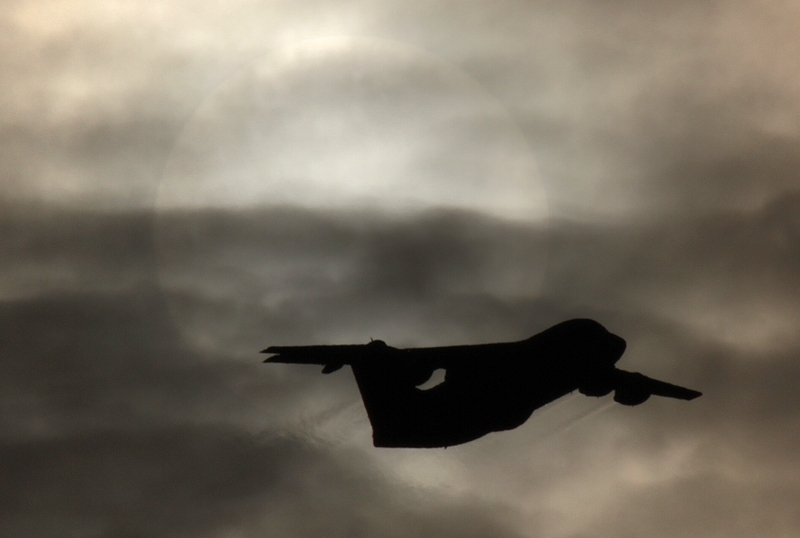 11/04/11 - 07:17. 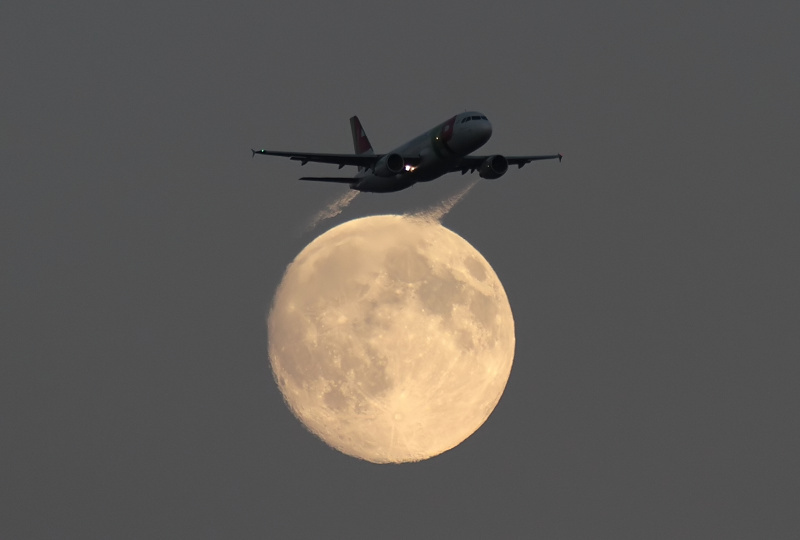 Brussels Airlines A330-301 OO-SFN (same aircraft but 3 minutes later at 1500 ft !) 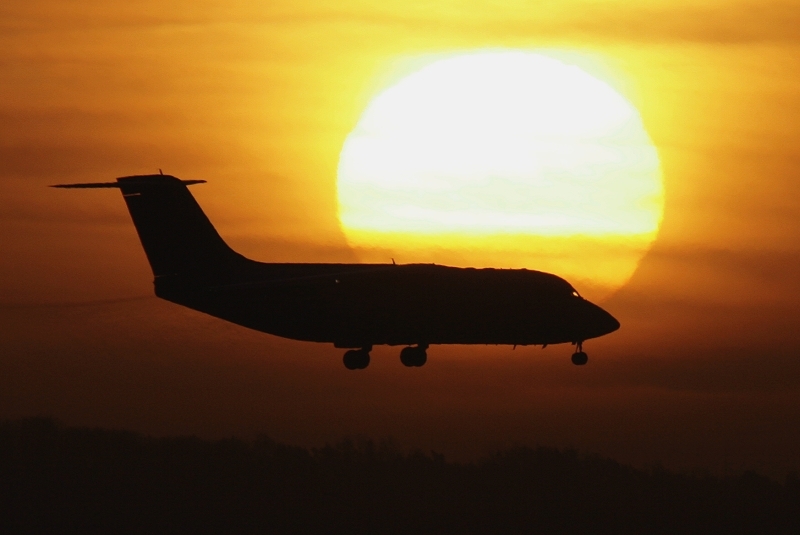 coming from Bujumbura-Nairobi as SN453 on finals 25L catching a rising sun. 11/04/11 - 07:14. 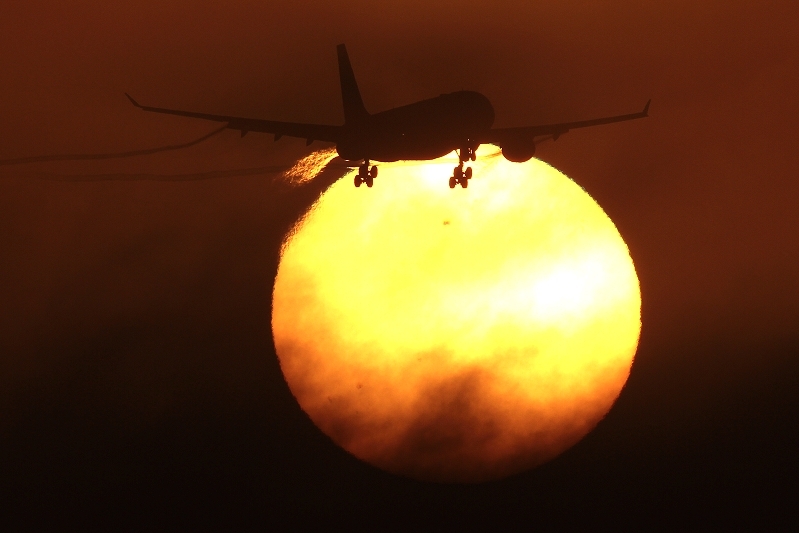 Brussels Airlines A330-301 OO-SFN at 3500 ft vectoring for 25L coming from Bujumbura-Nairobi as SN453 catching a rising sun. 09/04/11 - 07:21. 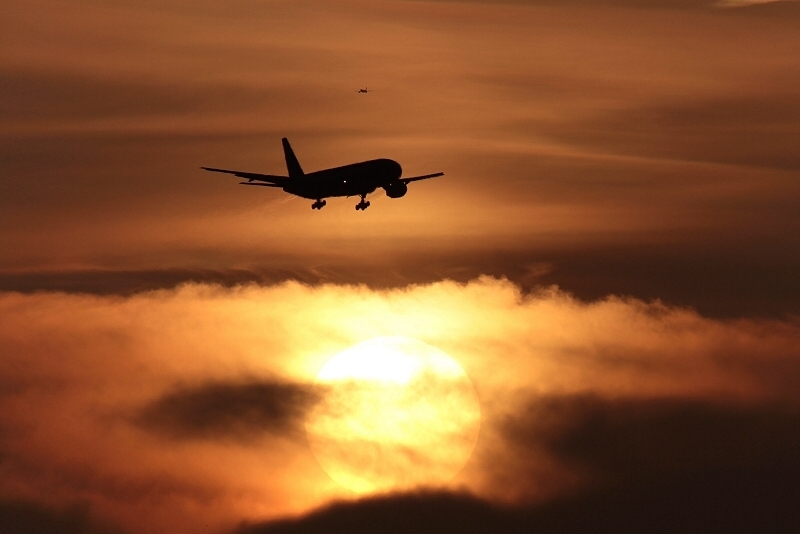 Brussels Airlines A330-301 OO-SFM coming from Yaoundé-Kinshasa as SN354 on finals 25L catching a rising sun. 05/04/11 - 08:24. 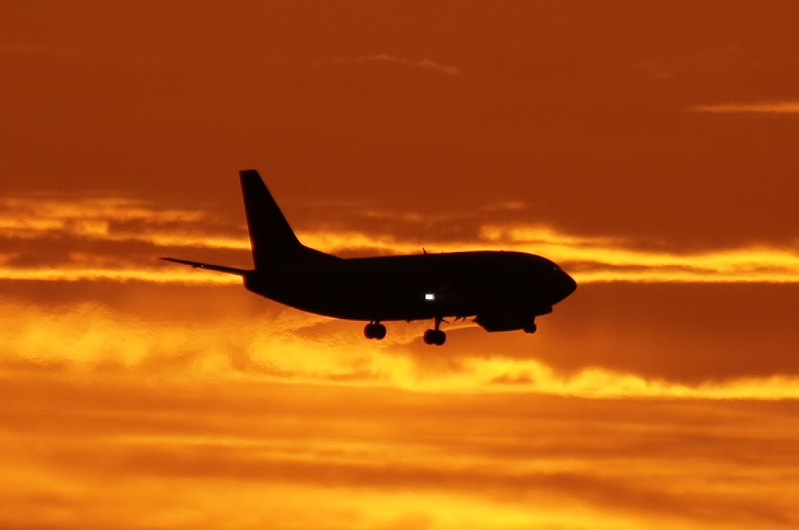 Brussels Airlines RJ85 OO-DJV coming from Bologna as SN3130 on finals 25R catching a rising Sun. 04/01/11 - 09:08. 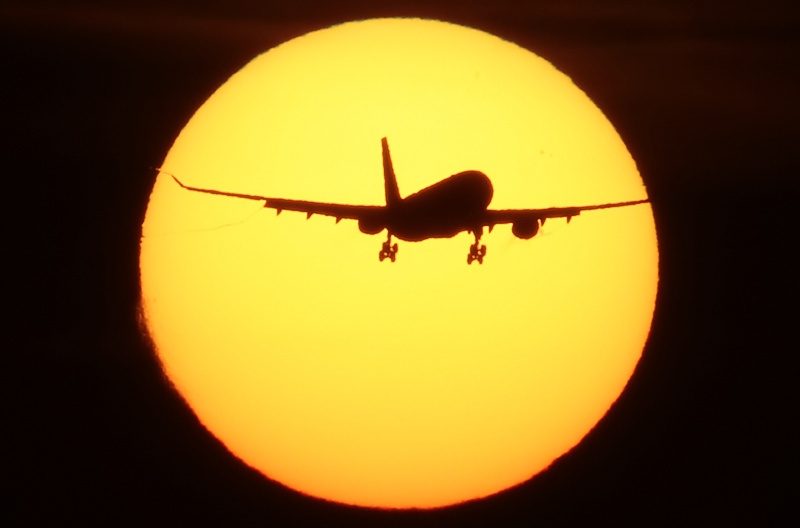 Aer Lingus A320 EI-DES coming from Dublin as EI630 on finals 25L catching a rising "eclipsed" Sun. 04/01/11 - 08:55. 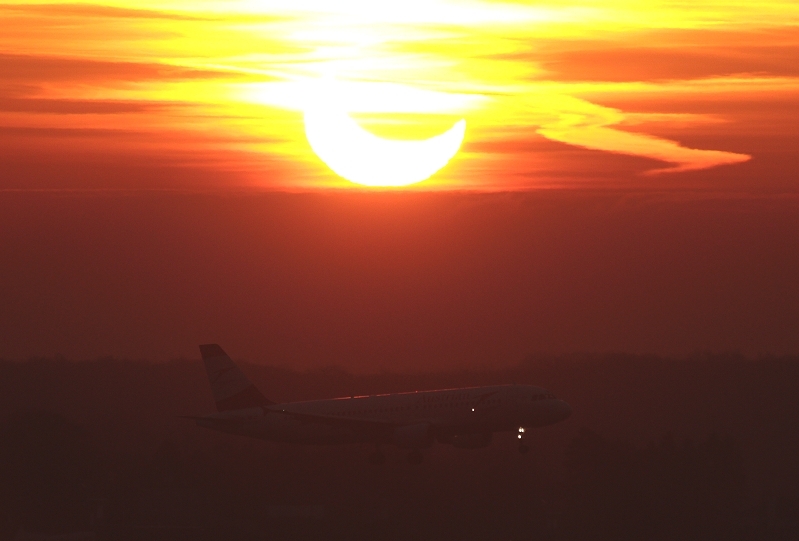 Austrian A320 OE-LBO coming from Vienna as OS351 on finals 25L catching a rising "eclipsed" Sun. 04/01/11 - 08:53. 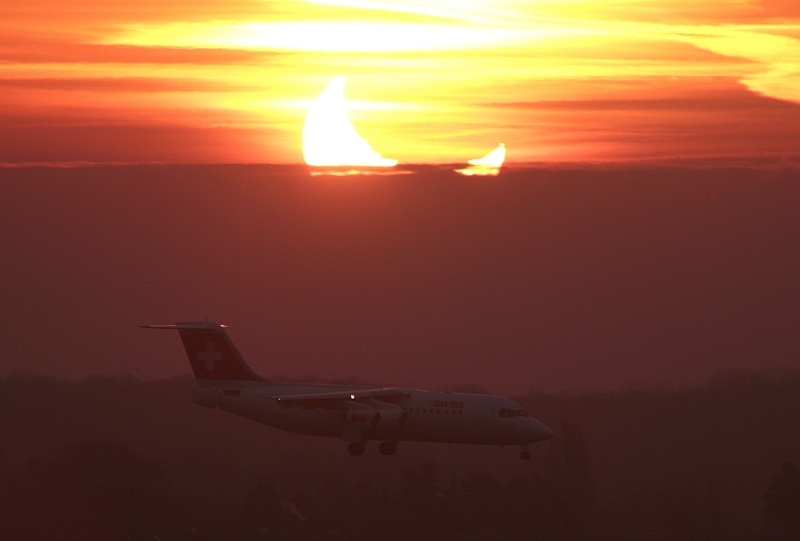 Swiss RJ100 HB-IXN coming from Zurich as LX786 on finals 25L catching a rising "eclipsed" Sun. 04/01/11 - 08:51. 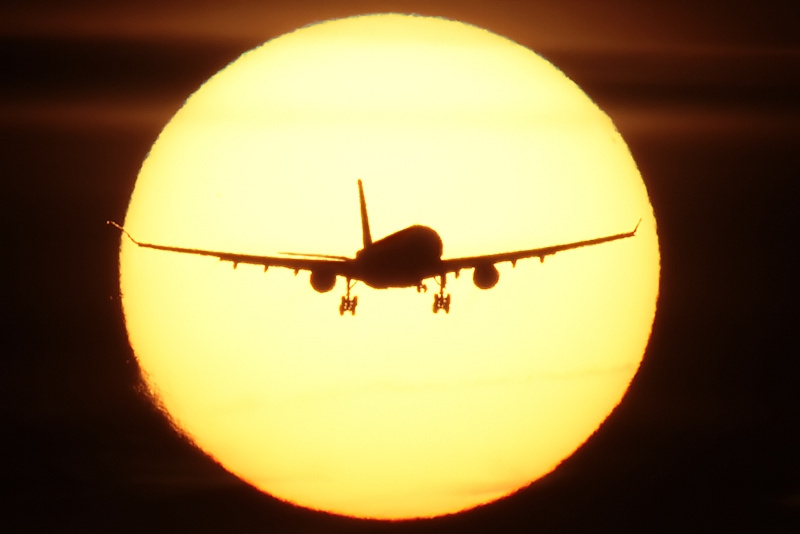 British Airways A319 G-EUPN coming from London (LHR) as BA388 on finals 25L catching a rising "eclipsed" Sun. 22/10/10 - 08:35. 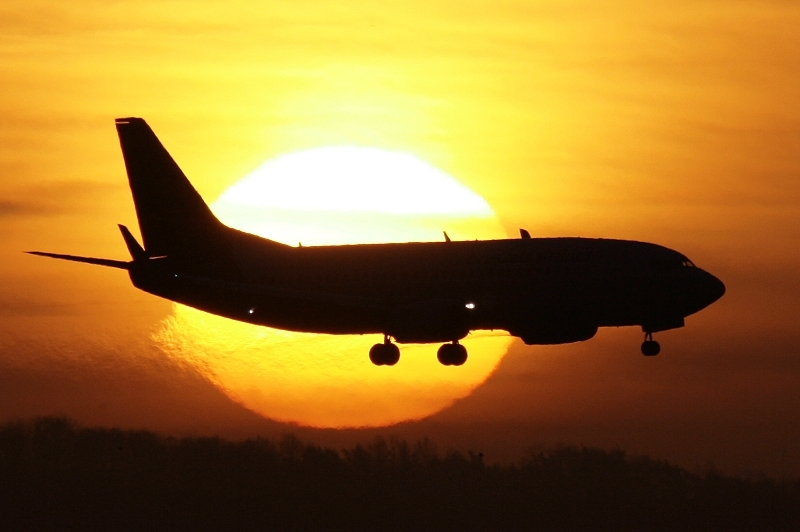 Air Baltic B737-522 YL-BBP coming from Riga as BT601 on finals 25L catching a rising Sun. 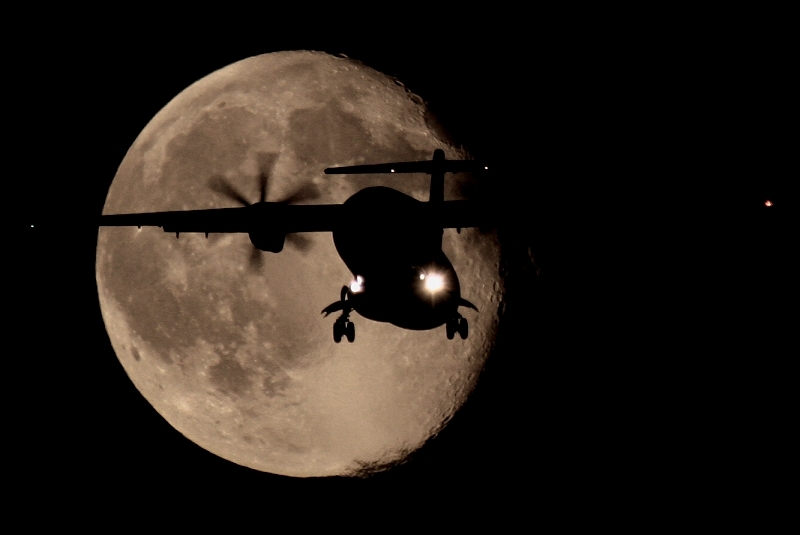 21/10/10 - 18:36. 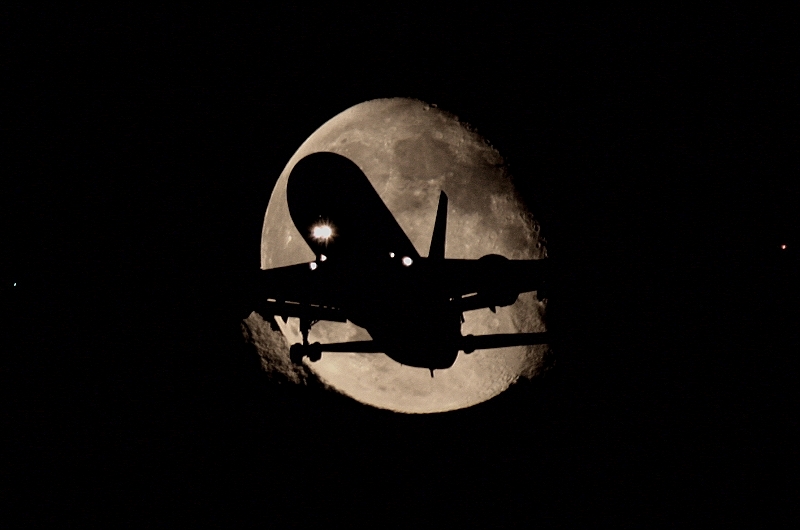 TAP A320-214 CS-TNS coming from Lisbon as TP614 on finals 25R catching a rising Moon. 03/06/10 - 08:24. 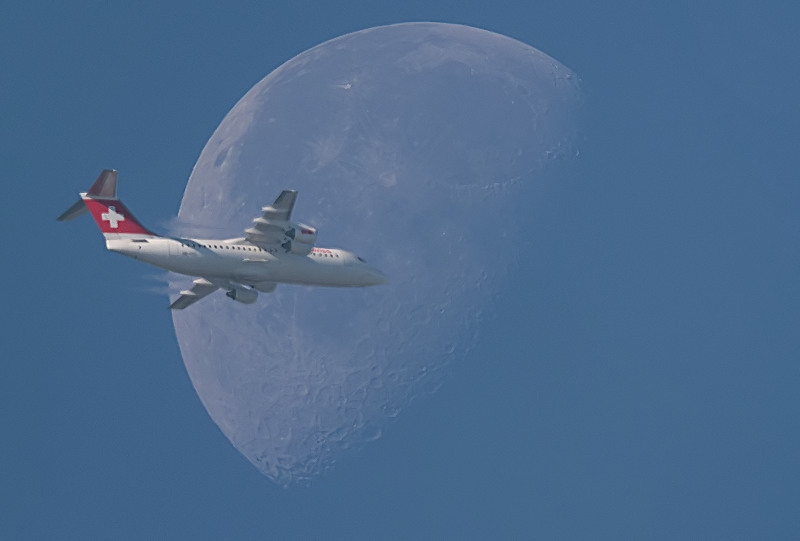 Taken with a telescope at 1200 mm, Swiss Avro RJ100 HB-IYQ coming from Zurich as LX786 vectoring for 02 catching a rising Moon. 24/04/10 - 06:52. 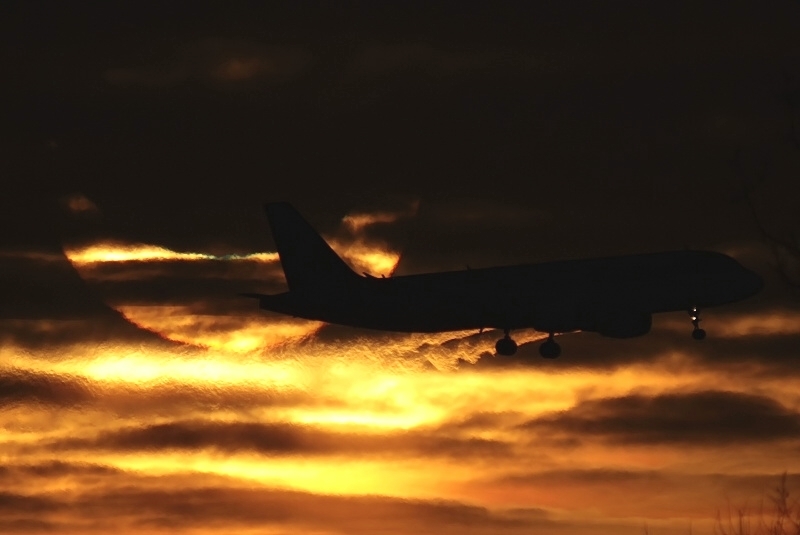 Brussels Airlines A330-301 OO-SFM coming from Yaoundé-Kinshasa as SN354 on finals 25L catching a rising sun. 27/03/10 - 06:49. 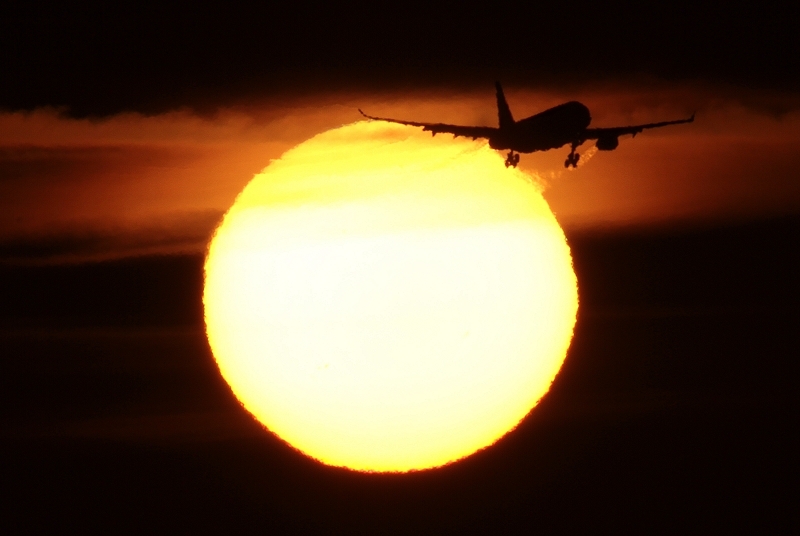 Turkish Airlines A319-132 TC-JLM coming from Anadolu as TK1931 on finals 25L catching a rising sun. 27/03/10 - 06:47. 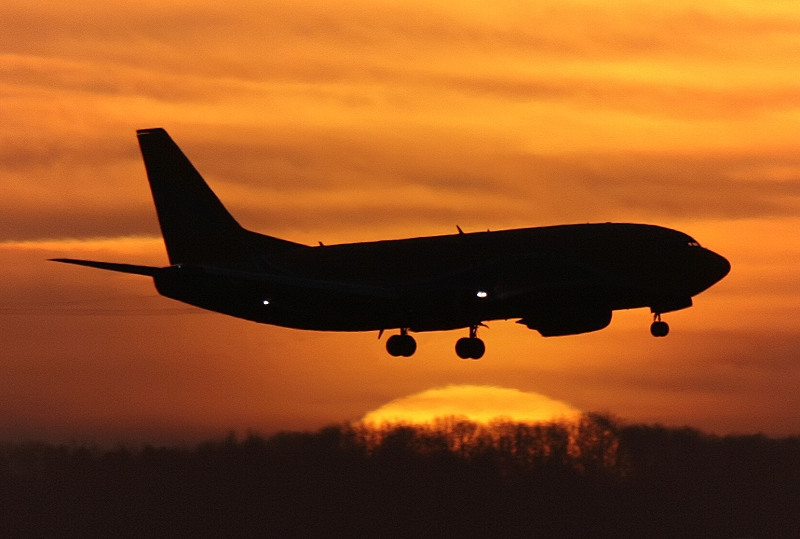 Continental Airlines B767-424(ER) N78060 coming from Newark as CO060 on finals 25L catching a rising sun. 27/03/10 - 06:44. 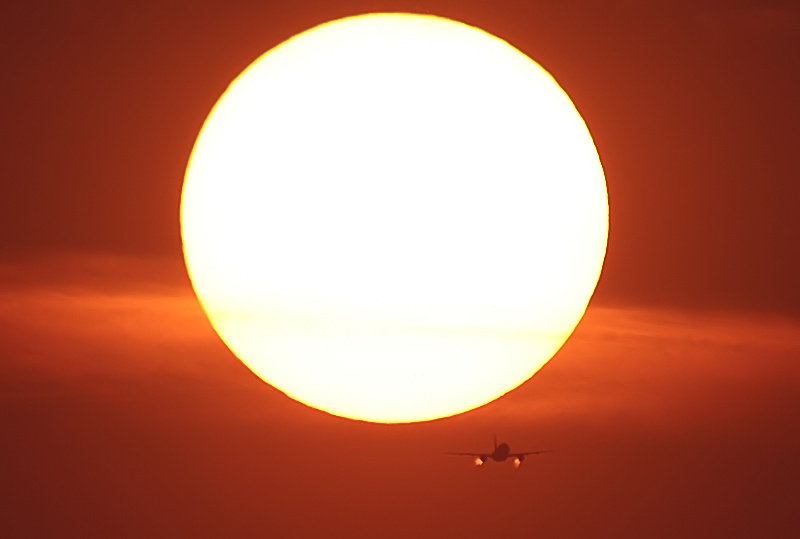 United Airlines B777-222 N781UA coming from Washington as UA950 with far behind Turkish Airlines A319-132 TC-JLM coming from Anadolu as TK1931, both on finals 25L catching a rising sun. 24/10/09 - 08:29. 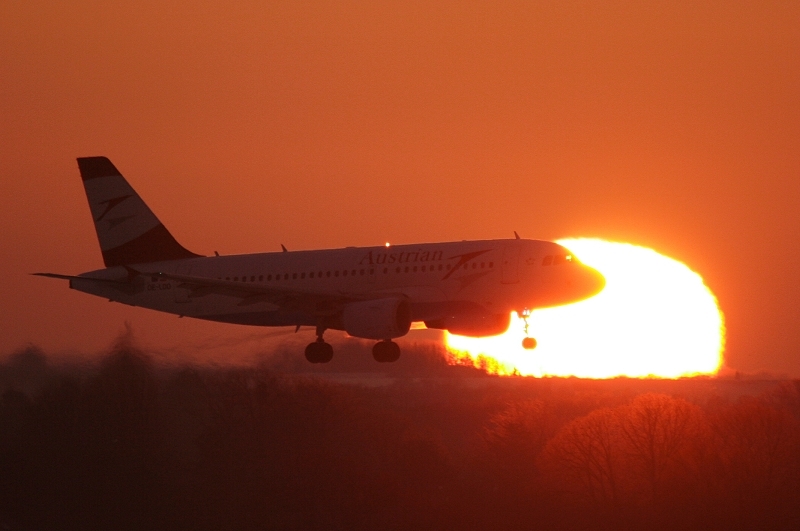 Brussels Airlines B737-43Q OO-VEP on finals 25L catching a rising sun. 24/10/09 - 08:21. 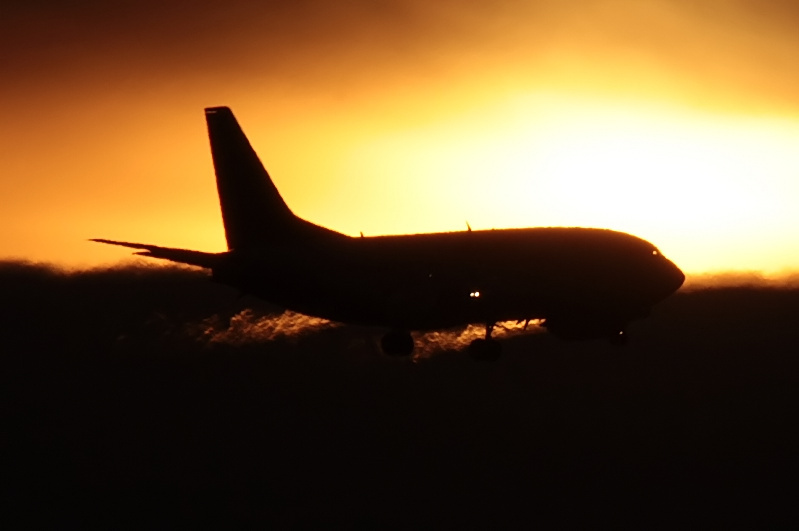 CSA B737-55S OK-XGC was coming from Prague as OK630 on finals 25L in the early morning light. 26/09/09 - 07:50. 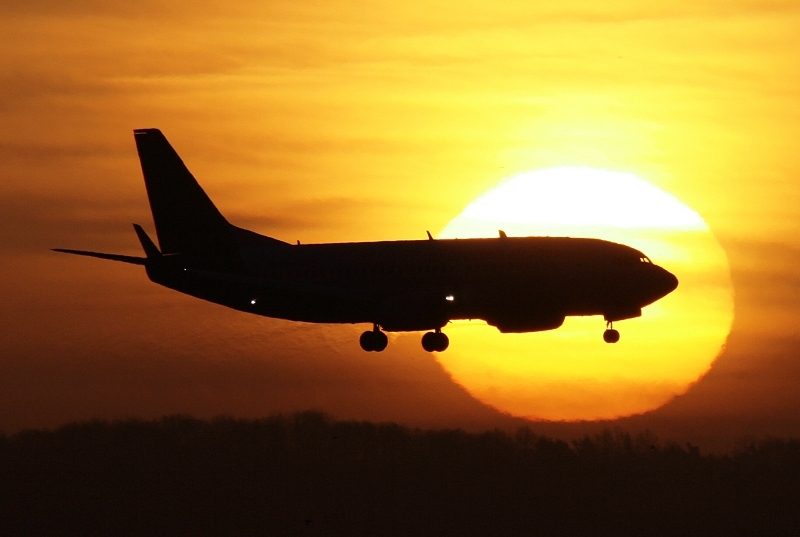 Brussels Airlines B737-36N(WL) OO-VEX was coming from Copenhagen as SN2266 on finals 25L catching a rising sun. 26/09/09 - 07:46. 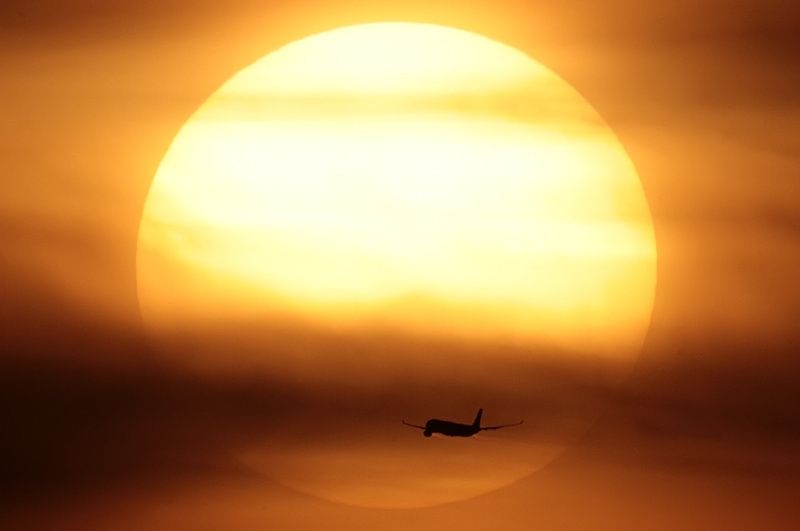 Jet Airways A330-202 VT-JWQ was coming from Mumbai as 9W228 on finals 25L catching a rising sun. 18/09/09 - 07:49. 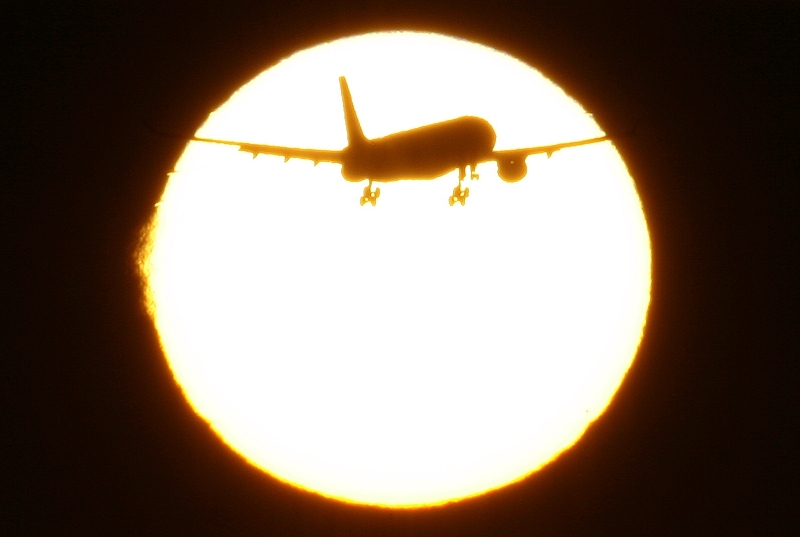 Jet Airways A330-200 VT-JWG was coming from Newark as 9W227 on finals 25L catching a rising sun. 31/08/09 - 19:41. 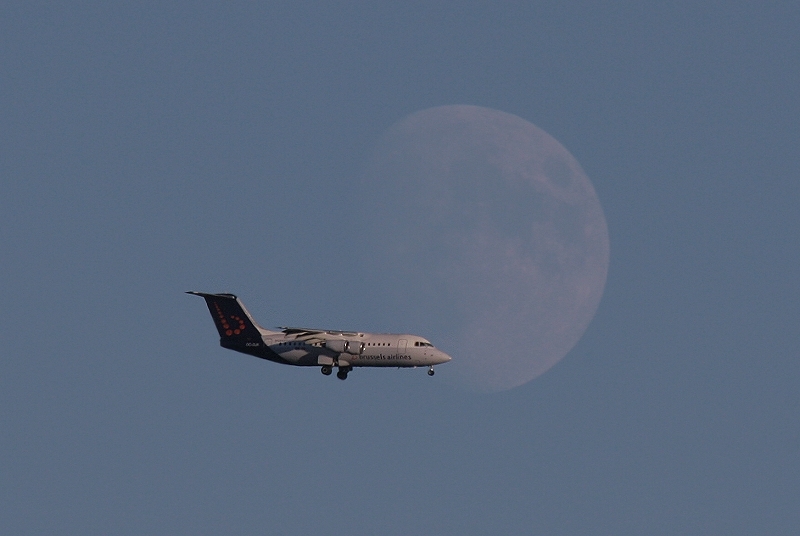 Brussels Airlines RJ85 OO-DJK was coming from Manchester as SN2178 on finals 25L catching a rising Moon. 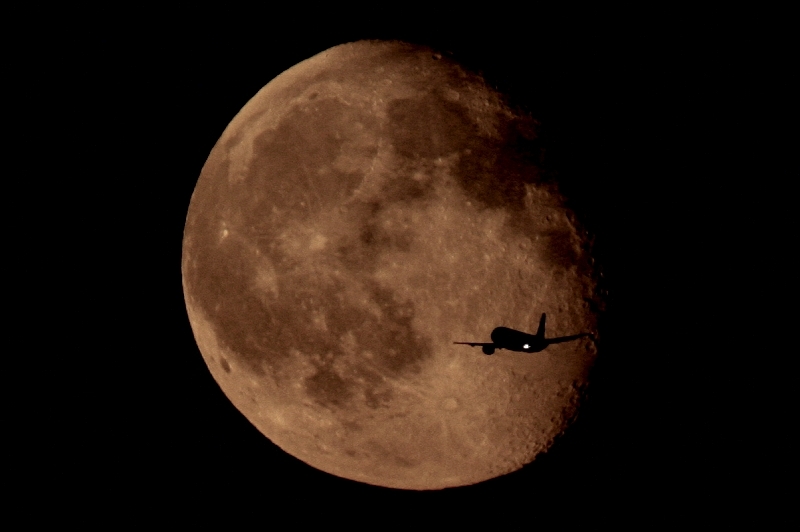 04/08/09 - 21:31. 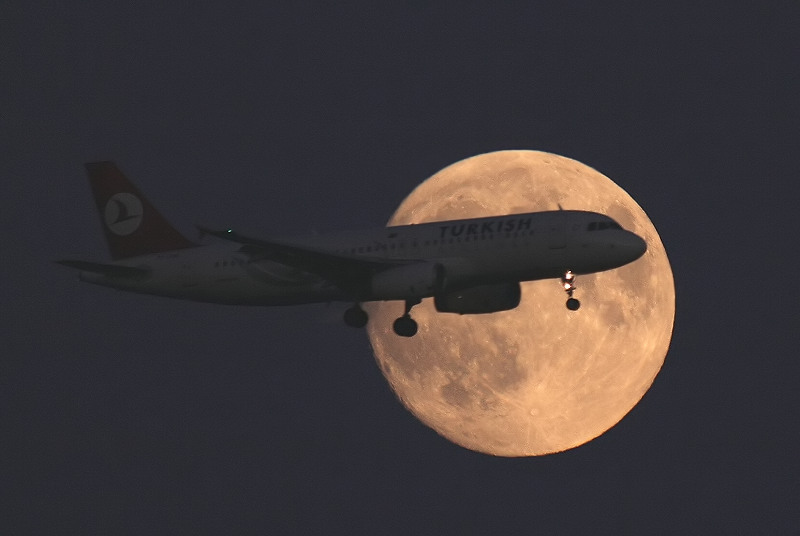 Turkish Airlines A320 TC-JPB was coming from Ankara as TK1933 on finals 25L catching a rising Moon.